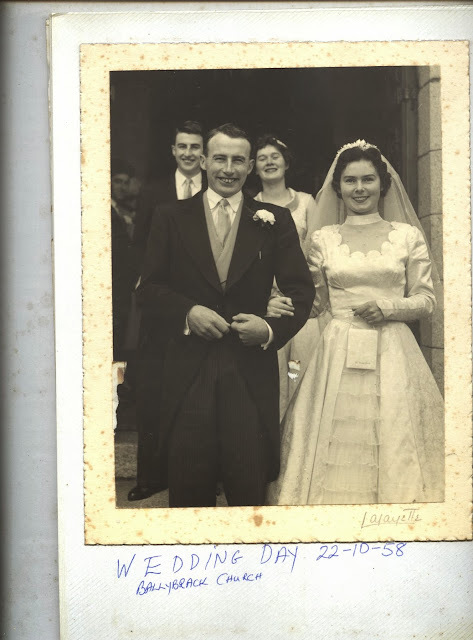 Careful With That Axe, Eugene: My Mum and Dad - 55 Years Married Today! On 22nd October 1958 Phil Byrne from Gorey and Joe O'Loughlin from Carnew, were wed in Ballybrack Church in South Dublin by Joe's uncle Monsignor Charles Hurley. Today is their 55th (Emerald) wedding anniversary - an increasingly rare achievement you'll agree. Below are scans of some photos (click to enlarge) from the day - sadly most in the group photo are no longer with us. Congratulations to my Mum and Dad - roll on the 60th anniversary!